One needs little coaxing to catch guitarist Warren Mendonsa, bass monster Nucleya and electro-fusion artist Karsh Kale playing under the same roof, or in this case, on top of a roof on Sunday October 16, as part of the 2016 edition of Red Bull Tour Bus – Off the Roof event at Hindu Gymkhana in Marine Lines. With his guitar chops and blues hooks, guitarist Warren Mendonsa is probably India’s high priest of blues music. Bass monster Nucleya on the other hand, has revolutionised his brand of electronica-meets-Indian-street-percussion and filled stadium with fans. Multi-instrumentalist and electro-fusion artist Karsh Kale, meanwhile, has collaborated with the likes of Ravi Shankar, Sting, Herbie Hancock and Anoushka Shankar. So one needs little coaxing to catch these musicians playing under the same roof, or in this case, on top of a roof on Sunday October 16, as part of the 2016 edition of Red Bull Tour Bus – Off the Roof event at Hindu Gymkhana in Marine Lines. The bill also includes playback singer Benny Dayal’s project called the Benny Dayal Funktuatin as well as Ahmedabad post-rock outfit As We Keep Searching. 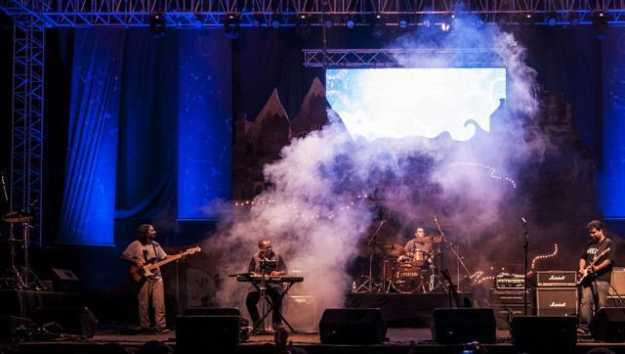 Mendonsa will take the stage with his band Blackstratblues comprising Jai Row Kavi on the drums, Beven Fonseca on keyboards and Adi Mistry on bass. With some stellar albums to his credit, including last year’s, The Universe Has a Strange Sense of Humour, Mendonsa will perform his gritty, yet zealous blues and rock numbers. With his sophomore album titled Raja Baja, released last month, Udyan Sagar (aka Nucleya) is clearly one of our busiest musicians with gigs lined up from Melbourne to Shanghai. Although he won’t be playing the entire album, Nucleya is slated to spin and tweak some of the tracks from Raja Baja. Kale is scheduled to perform with his collective called Karsh Kale Soundsystem, joined by Mendonsa and other musicians. Multi-lingual playback singer Benny Dayal has been testing tunes with his new project for some time, while As We Keep Searching will showcase some of their post-rock music.